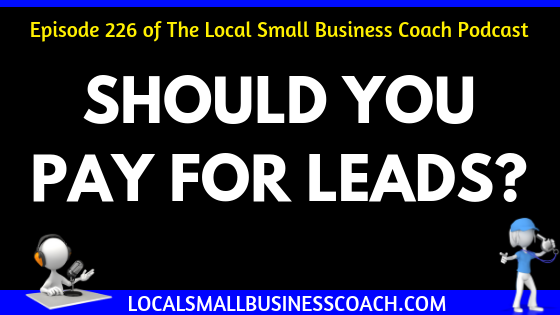 Local Small Business Coach | Improve Your Profits & Sales: Should You Pay for Leads? | Is Home Adviser, Angie's List, Next Door & Thumbtack Something You Should Try? Should You Pay for Leads? | Is Home Adviser, Angie's List, Next Door & Thumbtack Something You Should Try? Should You Pay for Leads? In today’s episode: Should You Pay for Leads? | Is Home Adviser, Angie's List, Next Door & Thumbtack Something You Should Try? With so many companies popping up and offering small businesses leads for their service-based business, you are probably wondering if this might be a good option for your business? I will tell you that after speaking with multiple small business owners, the feedback seems to be mixed. There are those that swear by them and those that have bad experiences. The key is what you return on investment is. For example, if you spend $1000 to chase leads you need to produce enough sales to create enough profit to break even. No charge for the leads? Then you want to make sure that you aren’t having to fight 3-4 other business owners to get to them first. You want to make sure they are quality leads and you want to make sure these folks aren’t just looking for the cheapest deal they can get. I’m a bigger fan of those that help you with leads in your local community. Even if you only do them for a year, you get to build your brand in the community. For more on my thoughts, check out the episode to hear more!